Don't worry. Be happy. Keep learning. : Organize jewelry. If you've been reading my blog long, you might remember my awesome [to me] idea for hanging my necklaces. If not, click here. 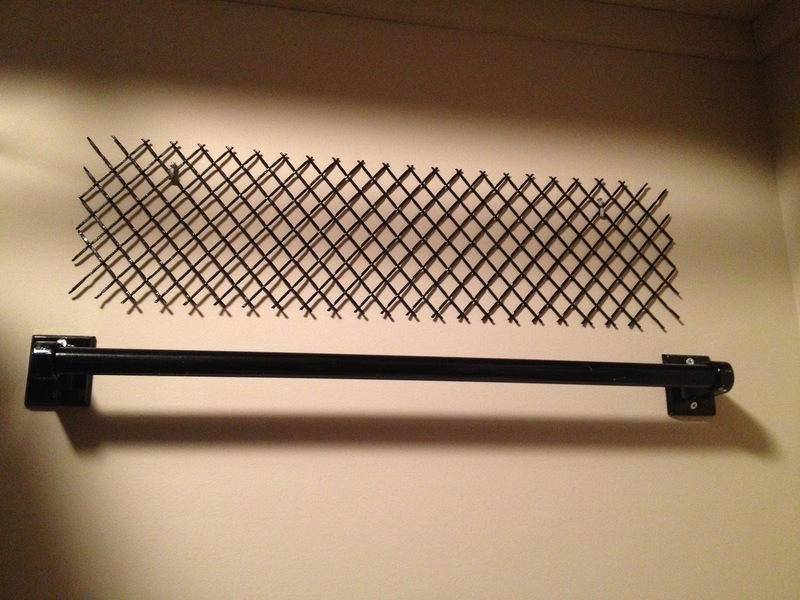 Since we moved from our old house into our new one, I haven't reinstalled my necklace rack, even though we've lived here for 2 months already. Oops. Last night I decided to just do it. Get it assembled and get my newest idea added to it. What's my newest idea? 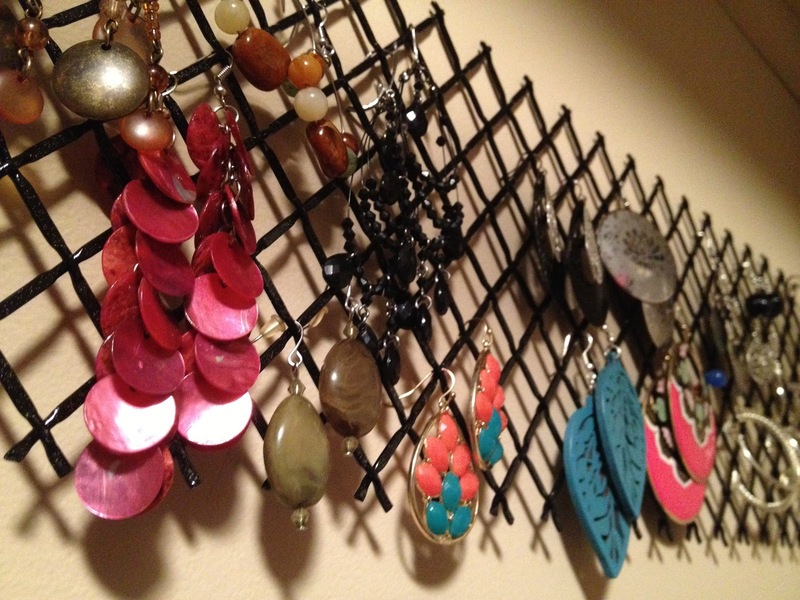 Well, storing my necklaces on a rod is great, but what do you do with your earrings? Many moons ago I was wandering through our local Habitat for Humanity Restore and saw an acordian-like metal thingy that I figured was used as a vent cover or Barbie gate or something. If you know, tell me. Either way, a light bulb went on over my head (about 3" up). 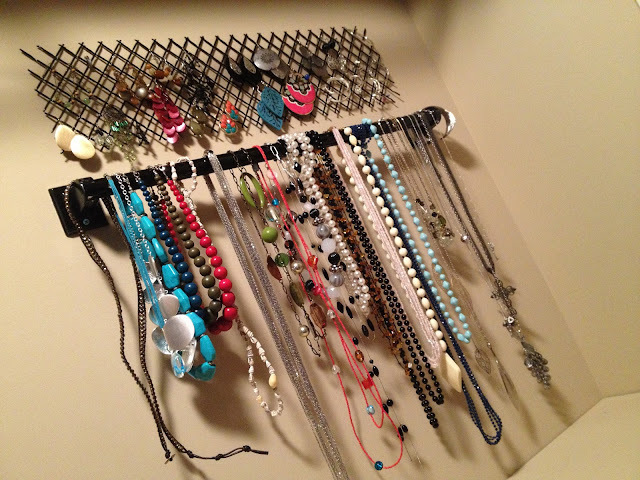 This would be great for hanging my earrings! So I bought it - because it cost about 30 cents and I spray painted it black and VOILA! Behold . . . . my new arrangement in my closet! I can now house both necklaces AND earrings! 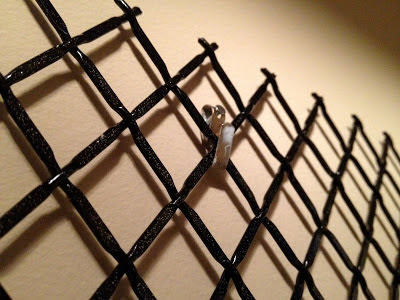 I fixed the accordian-like metal thingy to my wall using picture hanging hooks and a nail. This allows it to stick out from the wall a little bit so my earring hooks can get in and around to hang. I just love having this done. It makes me feel so organized. And though my husband won't say it out loud, he's probably so glad to have my jewelry off our dresser and finally where it belongs! at 1:37 PM Topics: Blog., DIY., Handy Tips., Organization., Style. Great idea! I love your creativity! I can't wait to put these in my closet. Thanks for sharing. Great! I wish you the best!